ETSC is calling on the European Commission to come forward with a long-awaited target to reduce serious road injuries. The European Commission, for the first time, published a figure in April for the number of people seriously injured on Europe’s roads : 135,000 in 2014. According to ETSC data, the numbers have declined much more slowly than the number of deaths in recent years. ETSC has long argued for the need for a separate pan-European target to reduce serious road injuries, to complement the targets that have been in place since 2001 to reduce deaths. Since 2010, the European Commission has been committed to introducing such a target. Two years ago, the crucial common definition of the types of injuries to be recorded and tracked was approved. A target was finally expected to be set in the first half of 2015, having been promised ‘shortly’ in a Commission press release of 24 March 2015. But the European Commission backtracked, and the target is now in limbo. ETSC is calling on the Commission to publish a target by the end of this year. 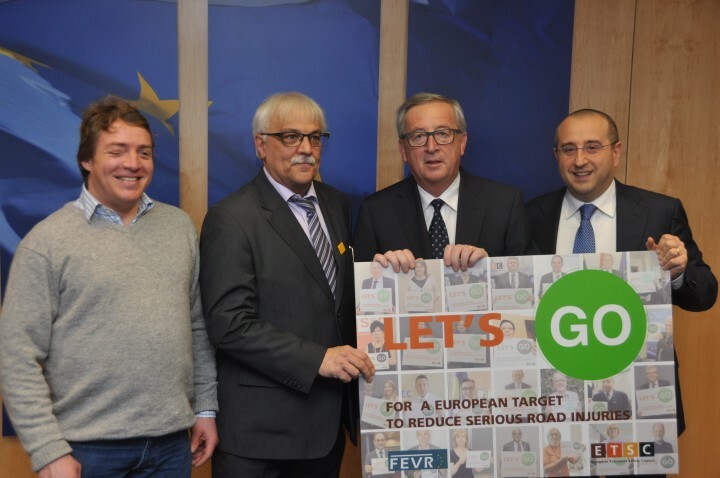 More than 70 experts and representatives of road safety organisations and victims groups from across Europe together with 12 members of the European Parliament have written to President Jean-Claude Juncker urging him to reverse the decision to drop the target. Transport ministers from Belgium, Cyprus, Finland, Hungary, Ireland, Lithuania and Luxembourg have also added their voices to the campaign. The Visegrad countries added their voice with a declaration in May. Public health groups and medical experts from across Europe joined the call this month. To find out more, read our briefing.